Since Jimmy moved to a new TJs, I have been doing the beer order for my store. I love doing the beer order, especially when new beers arrive! Kite Tail, by O’Fallon, a local micro-brewery located in St. Charles, Missouri, and Somersault, by New Belgium, arrived on Friday night. We had a quick tasting at the store, but the small, thimble-sized glasses didn’t do either of the new arrivals much justice, so while experiencing one of our BIG St. Louis spring storms, I decided it was the right time to give Kite Tail a proper review (the Somersault review is forthcoming). 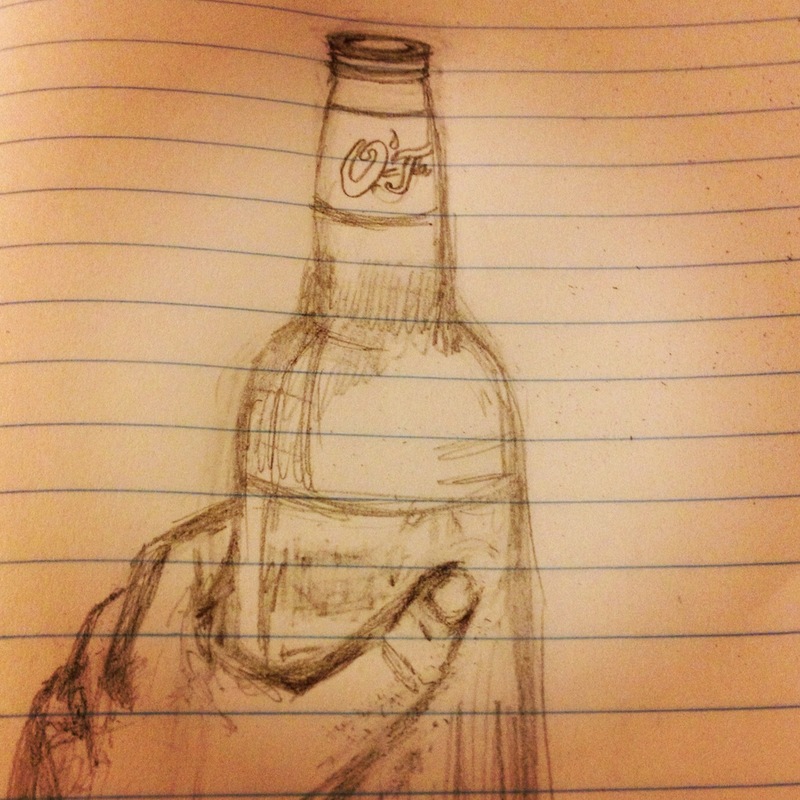 Before drinking I did a quick sketch (then I put that beer back in the fridge and got a fresh one). 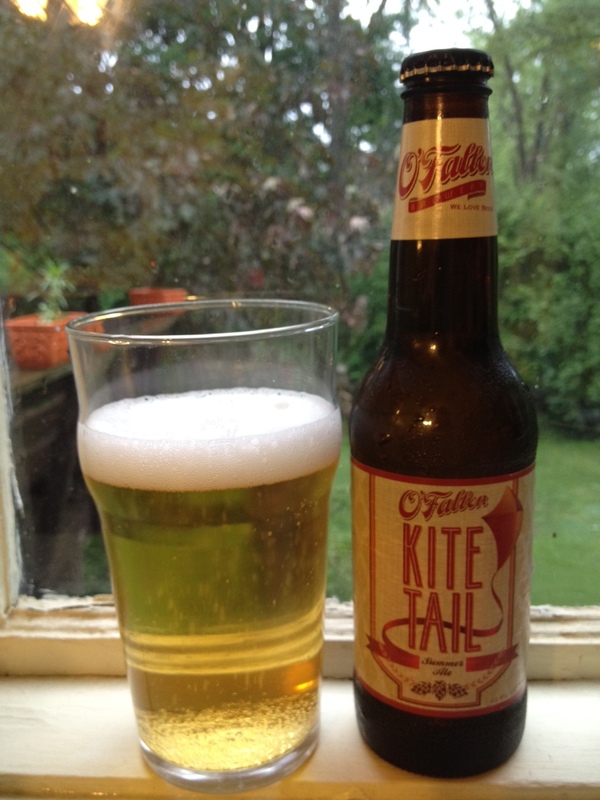 Kite Tail is a cream ale which combines the characteristics of an ale with a lager. “Cream ale is often a misunderstood style, and it’s something we’ve wanted to brew for a long time…Kite Tail is a classic cream ale so it’s crisp and refreshing, but it’s also flavorful and complex…”. Did Kite Tail live up to its cream ale rep? When poured into a British pint, Kite Tail is straw colored with lively bubbles and about a 1/2 inch of white foam. The bubbles made me think…summer! The smell of Kite Tail is reminiscent of a lager (slightly wheat-y), but it also had a light fruity aroma (apricot?). This beer is definitely crisp, clean, and smooth. It has a medium-bodied mouthfeel and the carbonation is perfect for a hot summer day. It finishes smooth with a lingering, slightly tart ending. I think Kite Tail could be a pleasant summer diversion, it is more flavorful than a typical lager, and ever so slightly more complex, but I didn’t find it to be memorable. I would definitely say that it’s a light summer beer, a thirst quencher on a hot summer day, but you will definitely need to drink this beer fast because the bubbles and head dissipate quickly and the beer falls rather flat. O’Fallon brewed Kite Tail with the goal of getting away from one of the current brewing trends of ‘hoppiness to the max’ and they definitely met their goal with this cream ale. For those who prefer lighter beers, I don’t think you will be too disappointed, however, I will probably wait until there is more sun and heat before reaching for another one. ← Give a shout for Java Stout?